Posts on Jeffrey Salkilld’s travels. Just a brief interlude. I am now back home from my travels but no fear the blogs will be continuing for some time. 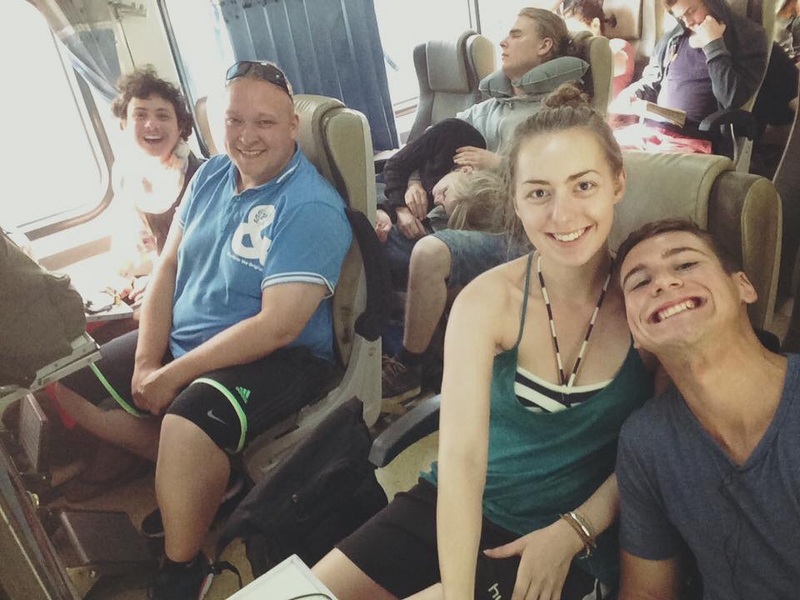 I have only got you up to day 45 (less than half way) as I was abroad for 99 days! I hope reading them is no less exciting with the knowledge that I am safe and sound in England. Coming home wasn’t as strange as I expected. On my return home from Africa in 2012 after only a month, I experienced ‘return culture shock’. So much glass (in the windows) everywhere and carpet, polished high streets with no shacks (even the rough areas looked flush). I was expecting the same on my return from Asia but I think because I was prepared for it, it never came. I am keen to complete the blog and it will be free to read here as before, but I have joined a community of artists and other creative minds called Patreon. This site allows us to fund our work, much like Kickstarter. However instead you ‘pledge’ a small amount per published article (for example $1, the site is in U.S. dollars). If you pledge a larger amount then you will get added bonuses like printed copies of pictures of your choice, or a custom upcycled item (from the William Stone Upcycled Goods side of the blog). My goal is to raise enough to print the blog as a travel book! And of course if you’re still pledging at that time you will receive a copy or get a percentage discount, depending on your pledge amount. 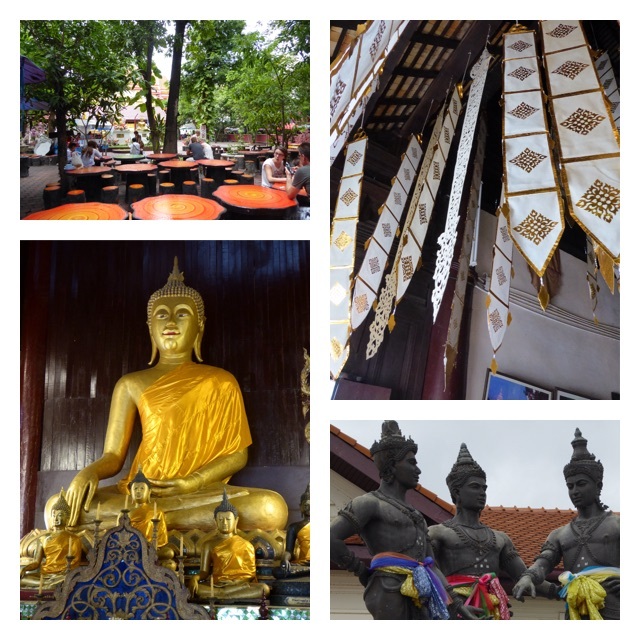 Keep on following here for days 46-99 of my travels in Asia. The main differences coming home have have been cultural and economical. For example I found it very strange looking at a brochure (that came through our door) for a weeks cruise in Europe at £1,500 pounds but for double that you could live in Thailand (in one place, not constant sightseeing) in a rented house (approx 450 baht a day, food, water, gas and electricity) for a year! Next up: days forty-six and forty-seven. 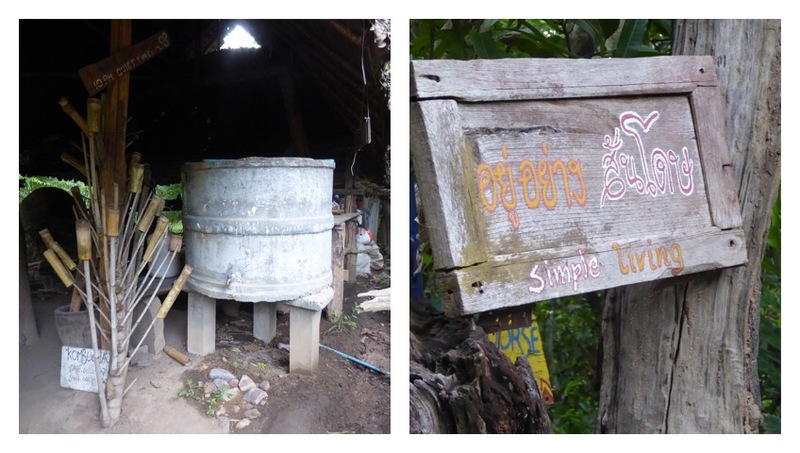 Today is the day I am going to the Organic Farmstay in Pai. Firstly I got up early and packed, and then asked in reception for the quickest way to 7-11. The guy actually recommend that I try Tesco Lotus which was very nearby at a gas station. I was unsure how food would work at the farm so I was planning to stock up on some dry snacks, determined that the same thing (that happened on the camping trip) wouldn’t happen again. I also bought a 50 baht rain-poncho (basically a very thin plastic sheet in neon pink) as I had no wet weather gear. Then I walked back to the hotel. At 11.50am I went to see if my laundry (which I dropped off yesterday at the place next door) was ready, it was. She did say to collect at 12pm but my bus was picking me up then and I wanted it all packed in my bag before then, ready to go. Of course I should have known that the bus wouldn’t be on time. I think it arrived in the end around 12.40pm so I spent a slightly frustrating but reasonably interesting hour in the reception watching two men install a metal shop grill shutter thing across the front of the shop. I was accompanied by a small Thai girl (it was Saturday so no school, but then I have learnt since that they don’t start school until the age of 7 anyway so maybe that is irrelevant), who was playing some kind of game on a tablet PC. The lady who may have been the owner, but who was often on reception, came and explained about the shutters. She said that a couple of nights ago someone threw a small molotov cocktail (which didn’t explode) through the wooden shutters (which was the only form of door the property had). I expressed my surprise, as I thought the area was very safe. She mostly agreed but had decided measures had to be taken hence the shutters. Anyway a songtheaw finally picked me up and took me to the bus station where (me and some other tourists) we were transferred into a small 15 person minivan. After an hour and a half the bus stopped for a quick rest break and I bought some interesting Thai sweets, much like chewits but from an obscure brand and mangosteen flavour! They were very nice! We arrived at 4.20pm ish in Pai, it was like a quiet giant Ko San Road, the town being three or so large main streets full of tourist shops. Anyway the annoying thing was that in the bus we drove right through the town that the Farm ‘Tacomepai‘ was situated in but (and I asked before when we first got on the bus) the driver would not stop to let me out. He kept saying ‘one stop one stop’, which is stupid really, it’s not like I wanted to be dropped off down a road just literally get out of the bus. So I had to pay a lot (200 baht) for a taxi to get back to the Farm because no one else was going that way, and I ended up with a whole mini van to myself. On arrival the Farm seemed deserted so the driver got out and tried to help me find someone. I don’t think he would have done this if I had change to pay him but I only had a 500 baht note and he had no change (which also seemed silly). We found an old lady sitting in the porch out of the rain weaving baskets. I had read about her on the farm website (she was described as Grandma, and it said she was always in the porch, if you wanted to watch traditional weaving). She spoke no English but went and got a mobile phone and put me on to her daughter (the wife of the farm owner), the person who I had been emailing. She seemed very surprised that I was there even though I had said I was coming, but explained in Thai to the Grandmother. The driver then asked the Grandmother for change and left once I’d paid him. I sat with the Grandmother in the porch, waiting for something (I didn’t know what), pointing at the chickens and saying ‘gai’ which is chicken in Thai the lady pointed at the ducks and said ‘bet’ which is duck (which I didn’t already know), so that was interesting. Then a Thai man arrived and gestured for me to follow him with my bags. He took me down a dirt track past some small fields on my right. Another volunteer appeared, she was French and spoke some English. She showed me to a hut but then the Thai man asked her to show me the next hut along instead. I asked her what I should do and she said tomorrow she would show me round the farm. Here a picture of my little house with ensuite bathroom. The bedding was very grotty looking so I was super glad I had my hammock and silk sleep sack. You can see in the pictures that I strung it up between two bamboo beams. 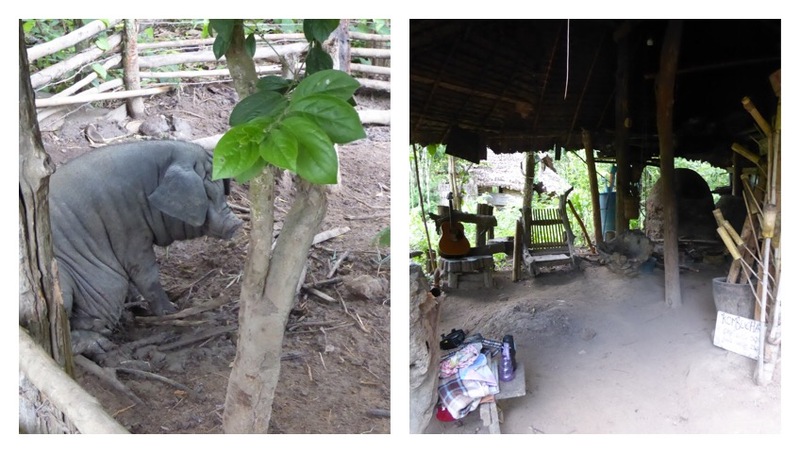 The hut was made from 100% bamboo and some kind of large leaf (maybe Palm leaf). I took stock of my food from Tesco, it was mostly snack food but I had one can of tuna because I was unsure if I would be fed tonight, arriving at the time I did. So I ate the tuna and then put it outside, not sure where to dispose of it just yet. The Thai man called me out of my hut and gave me some clean sheets and blankets. I used the blankets as a sort of carpet/mat under the hammock and I used one sheet. It was a duvet cover (and pillow cases) that I think was for the floor mattress bed and grotty pillows but I pushed it all to the side against one wall. Then the French girl came and called me for dinner! Yay food. It was rice with a vegetable/stew/soup thing. It had a good flavour as most Thai food does but was not very filling for me. It was like a watery stock with stringy leaves in it. The Thai are very clever with the food, they make a lot of flavour from very little but they also fill up on rice. I think my metabolism is set for meat and veg and rice doesn’t do much for me. Anyway when I returned to my hut I discovered I had made a new friend. A little white cat was enjoying the tuna water and dregs from the can I had left out (I was unable to drain it at the time of eating). She was very happy. A lot of cricket type insect nosies last night. I got up for 8.30am and went down to the volunteer kitchen for breakfast. There was a lovely sweet bread which was a nice surprise and also some egg and veg, and of course more rice. I couldn’t find the French girl who was supposed to show me round so I wandered up the the main house. Next to the house was a large wooden open walled building which was labeled the ‘classroom’. 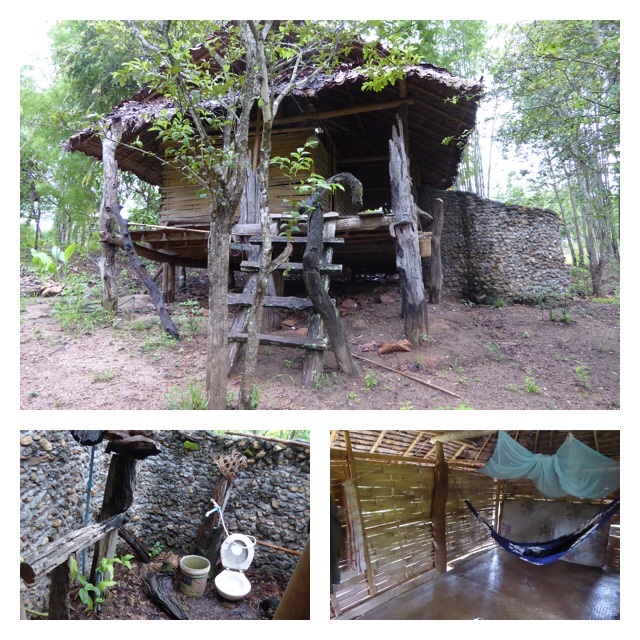 This is where the owner (when he was there) used to teach permaculture farming. I found a middle aged Swiss guy called Andy who was very nice and explained to me about the farm. It was built and designed by this Sandot the owner, a farmer who studied permaculture farming, he ran courses and volunteer programs until a couple of months ago when he just left to run a new project he had thought up. 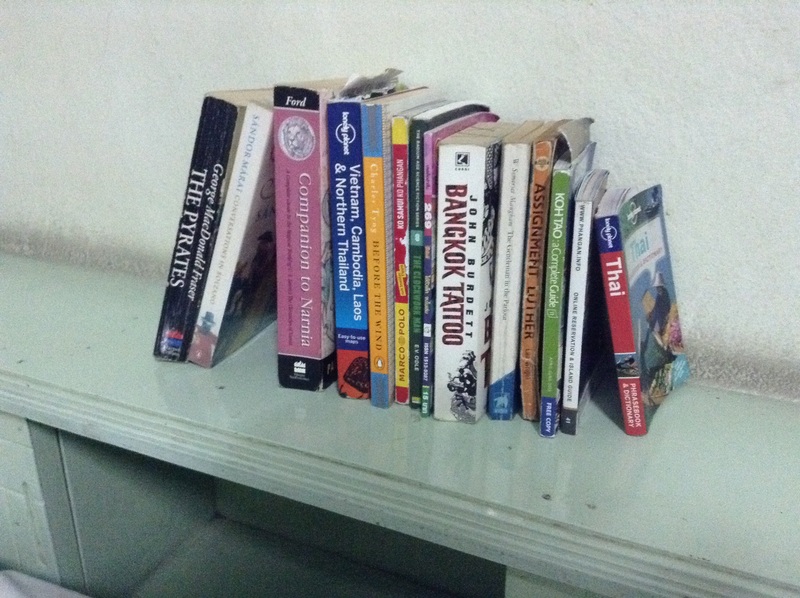 The new project was near the border further north, near Laos (or so I gathered). The only volunteer here was the French girl Carine who had been here over two months, since the last properly run course. He said he was hoping the owner was going to come back or maybe was going to formally sign over some control to him so he could continue with the projects. I asked what I could do to help and he said that he was leaving later today but I was welcome to help him clear up from his current project. He said it was a shame I wasn’t here last week as I could have helped with the building of his ‘art studio’. So I spend half an hour or so with his Thai wife/partner, clearing the waste wood that was scattered around the classroom building. This literally involved throwing the scrap bamboo into the forest that started a few feet from the building, of course it would rot down and be good for the ecosystem but it was amusing to me anyway. Then the Swiss guy Andy showed me the ‘art studio’, which was another wall-less structure with a strong concrete base a few inches thick and four metal girders supporting a corrugated iron type roof. There was a large locker which was full of tools and he said he hoped to rent the space out to artists etc. I told him about William Stone and some of our scrap art projects. He said I was welcome to use the space for free while I was here as he had no plans yet as such. I helped clear a bit more rubbish and this was stuff like plastic cement sacks which we threw in a pit (already full of rubbish) and I think they will burn it all at some point (that is what they do here in Thailand). There wasn’t much left to do that I could help with so I went to find the French girl. She explained to me that a lot of volunteers come and sit in the kitchen and smoke and drink and pay the volunteer fee (200 baht a day) but treat it as a cheap place to stay, and maybe do some yoga in the yoga hut. She was very fed up of this and also with Sandot the owner who had popped off to his new project. Her English was quite good and I think the reasons she was short with me yesterday was also because her English was a bit rusty, she also spoke some Thai in order to communicate with the farm hands etc and probably hadn’t spoken English for weeks. Anyway she said she studied permaculture farming and at the moment was just running her own little garden near her hut because she was unable to plan any big projects without Sandot’s help to explain it to the farm hands. 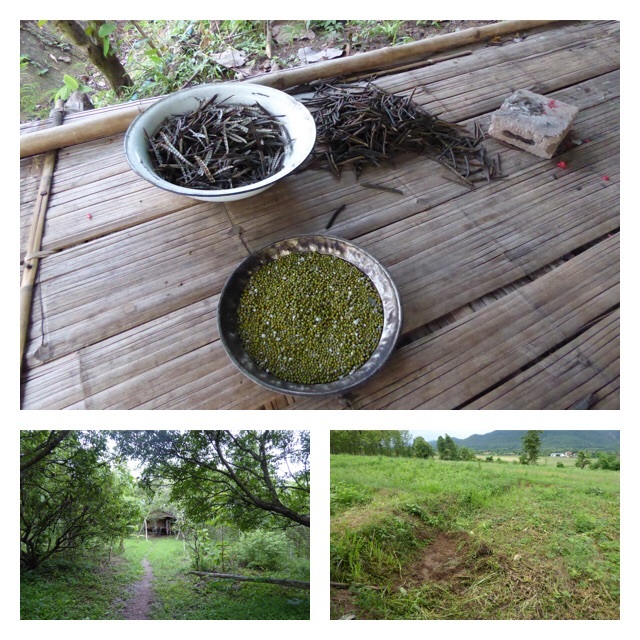 She showed me the last crop of beans and said I could help peel them and then after lunch, which appeared by magic on the table in the kitchen area (a pot of rice), she showed me a field I could start clearing. I worked for a couple of hours, using the traditional Thai farm tool which is like a large garden hoe with a slightly thicker and sharper metal head. Later at dinner (in the kitchen again) the French girl Carine talked about some of the problems with Thai farming. One being the lack of farm education and also that they didn’t remove ‘bad seed’ and just kept planting the same stuff every year, (in a couple of posts time I will explain how I learnt about their seed checking process which is very funny and illogical, which is strange as the Thai people are normally very logical). I mentioned the white cat and she said that cat was always bothering her, Carine thinks it was looking for some affection (her own words). She told me it also had two kittens but it killed one and kept trying to put the other one in her house. I haven’t seen any sign of the kittens though. The farm is set in a very beautiful flat area surrounded by other farms. It is nice and cool compared to the city’s, as there is a lot of greenery and damp air. It is also very quiet except for the loud insects in the evening. I can see why people like to come here for their yoga retreats. It has been a very interesting taste of the farm so far. I have enjoyed it even though it is very confusing as to what is going on…. Previously: days forty-two and forty-three. I wanted to spend some time in rural Thailand, I had previously emailed a bunch of places about volunteering, a couple of farms, a couple of animal shelters (there is a large stray animal, mainly dogs, population here), and a monkey sanctuary. No one had replied so this time round I emailed about 20 places with the hope that at least one would reply. Surprise surprise, several emailed back quite promptly, but due to what happen before I had already said yes to the first farm that replied. I then also made a provisional plan with the monkey jungle sanctuary for the following week, as their program sounded good. The farm that I will be going too (in a couple of days) is in Pai, North West of Chiang Mai. Pai is a place many people have recommend to me. 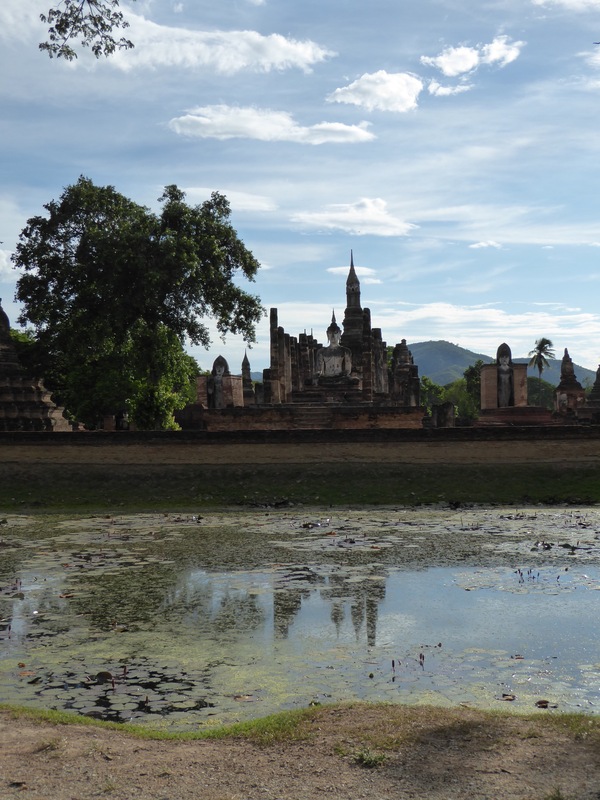 It is ‘supposed’ to be a more authentic town as not as many tourists venture past Chiang Mai. Thinking of my budget I decided to move hotels again. 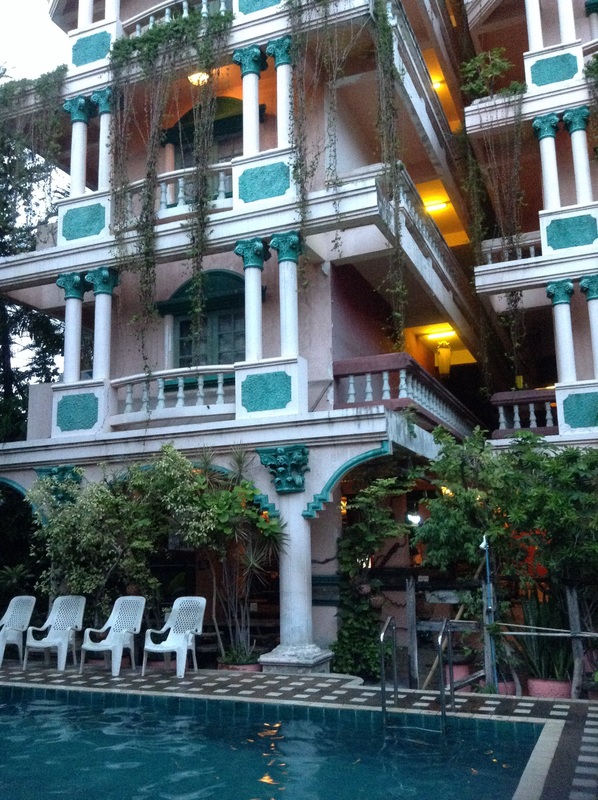 Using trip adviser I found a decent looking hostel with private rooms for only 251 a night, (their price is 250 but due to booking online and conversion rate it is 251, this happens sometimes). 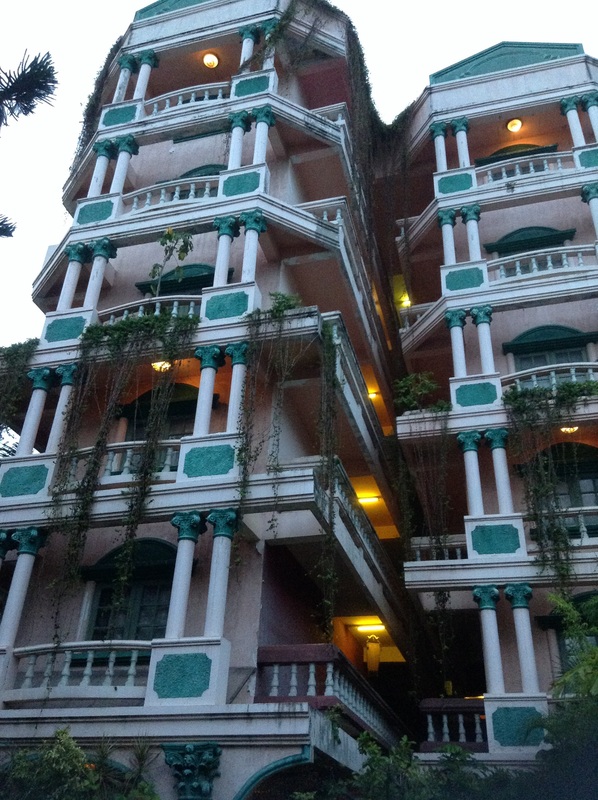 It was called the Cumpun Guesthouse and I walked there from the Royal Guesthouse using the paper map. I would be departing for the farm on Saturday the 18th, so I had two days to spend in the city, I didn’t really see a lot of it when I came last month, as we were only here for two days. I had a look at the leaflets in the lobby and on trip adviser. 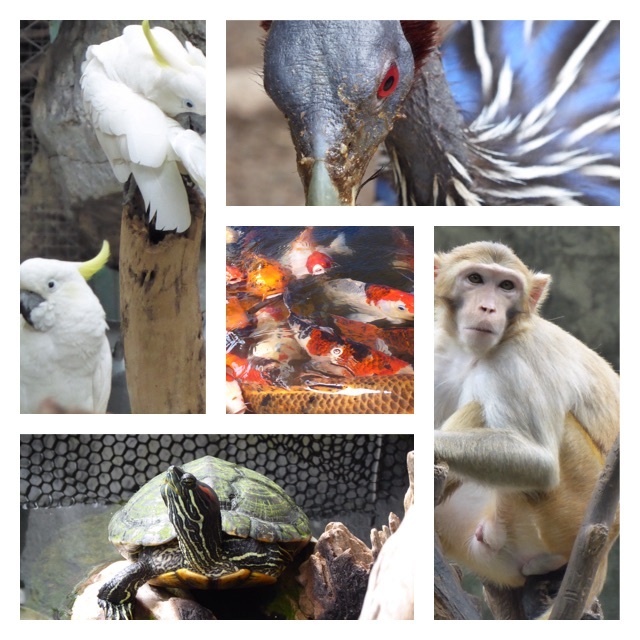 I discovered a zoo very near about 40 mins out of the city. I hailed a Songthaew, which asked for 100 baht to the zoo as I was the only customer. Normally they charge about 20/30 baht in the North. When I arrived the taxi driver pointed me towards the joint ticket counter where I could get a combined ticket to the zoo and aquarium. The first enclosure was some crested cockatoos! My fave bird (I even have a little tattoo of one). The zoo was laid out like a small safari park with the enclosures quite widely spaced apart, but they were in a sort of theme park style with concrete painted to look like wood etc, see pics. The birds didn’t look that happy, nor did the monkeys, whose enclosure was the worst in the whole park. But as I walked on (past the shuttle bus, which you had to pay more for) the enclosures got bigger. I fed the hippos, who had a nice pen with a pool. You could buy large chunks of carrot to feed them and they knew what was coming and stood there with mouths wide open. See pics. It was actually quite comical. There was a whole group of people there and the carrots sold out very quickly. It poured with rain for about ten minutes and I stopped next to the hippos to talk to an American couple who were doing TEFL in China and had a three week holiday which they were spending in Thailand. 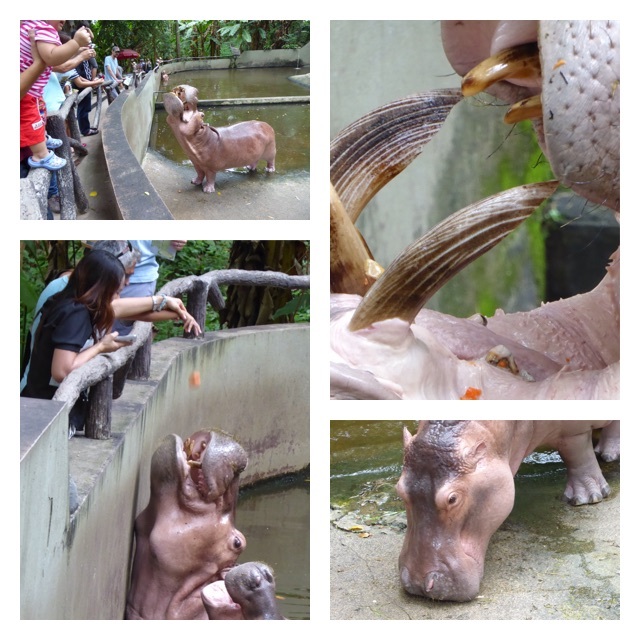 After the rain stopped a Thai man came to refill the carrots and I fed the hippos too. As I moved on, past some fibreglass animals (much like Blackgang Chine in the UK, on the IOW), I found two giraffes, in a decent sized pen with other herbivores, like goats. I fed these too and at nearly every enclosure you could pay 10 or 20 baht for a plastic tub of chopped vegetables, and in the big cats cage, you could buy raw meat on a stick to poke through the bar! Yes this is true! I have never see this in a zoo before. Edventually I came to the aquarium, which had a massive fibreglass sharks head protruding from the roof. It was a decent enough size but you could only go in one tunnel as the other was under construction. The tunnel I did go in had a very fancy conveyer-belt that would take you round (but the power was turned off, maybe they turn it on during busy periods). 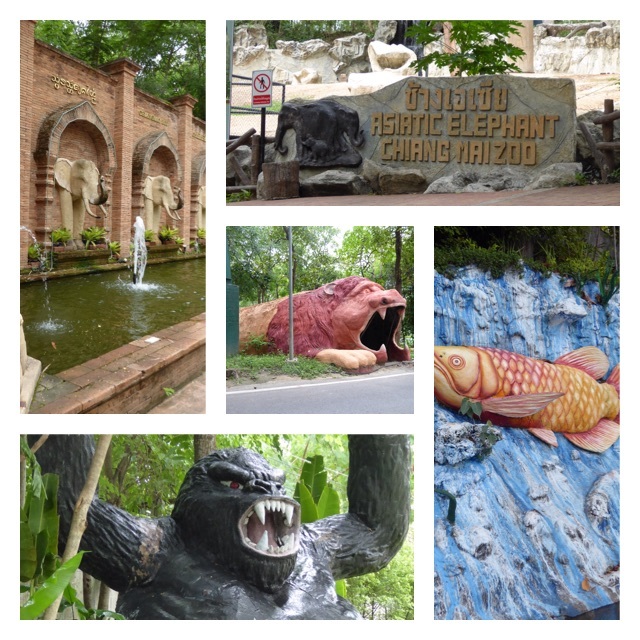 After the aquarium I walked round the last third of the park (you could walk all the way round on the concrete road) and then reached the entrance again at around 4.30pm, which managed to concede with some other people leaving in a songthaew. Back at the hotel my room was now ready (it wasn’t this morning at 10am when I arrived), so I collected my main bag, from where I had left it in reception (quite safe). I walked out about fifty metres to a street food stall, where I had a lovely chicken salad (this is English chicken salad, as in Thai food a salad is a complete different dish), but a disgusting orange squash, which I didn’t finish. I then visited the night market and replaced my flip flops with a new pair and bought a few souvenirs. The last stop of the night was of course, 7-11. This morning I chatted to a Silja on facebook, she and the others were off on their three day jungle trek today. I told her about my plans for the Farmstay. Then I headed off to find several museums that I had found on trip adviser (and which were vaguely marked on my paper tourist map). My first stop turned out to be to buy a pair of those baggy hippy traveller trouser (you can buy them all over Thailand). I had been considering a pair for a while and my justification was that I didn’t have a pair of trousers that I could use for messy activities on the farm. Then very shorty I came across a lovely temple. It was very calm and peaceful, they were playing some oriental music from speakers set high in the walls. 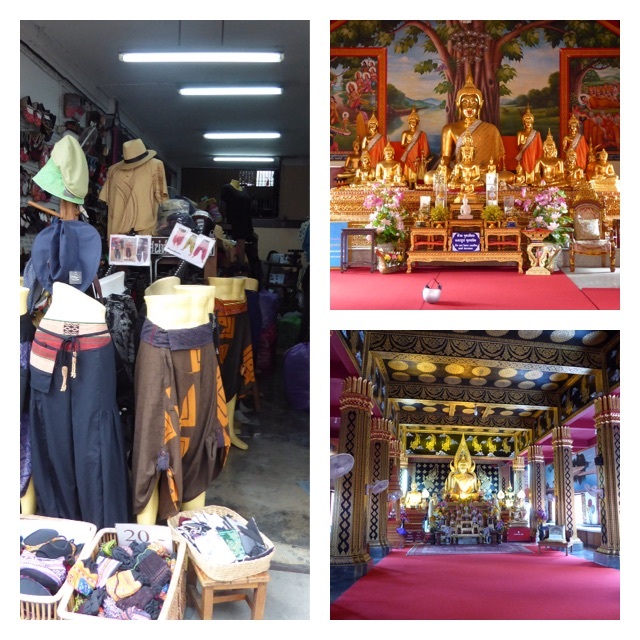 The trouser shop where I bought my baggy trousers, and the first couple of temples I visited. I moved on and aimed in the generals direction of the museums. On the way I stopped at another temple, this one had quite large buddha statues and was set in a small area of grounds with a seating area. They were also playing music. I had an early lunch from one of the street stalls, there where quite a few Thai people eating too. It felt like people used this daily, much like a canteen crossed with a local park. There were quite a few stalls dotted about selling the usual souvenirs. One lady showed me a necklace she claimed was crocodile teeth, which at the time I didn’t believe (most of these teeth are moulded resin) but you will see in a later post, having been to a crocodile farm (in a few weeks) it is quite possible that this was true. I was a bit lost so I asked a local (in Thai) where I was, and he spent ages pouring over my map. After a while a couple of ladies came over to help and we came to conclusion that the temple we were standing in wasn’t on the map! Of course they found this very funny, most simple things will get a Thai in stitches, but they pointed me in a vague direction. I didn’t hold out much hope for this as the Thai people seem to be very inaccurate when it come to directions. I found the Architecture Centre/Museum and another nice temple next too it. There was also a young monk school here as the area (and the public toilet) was full of mini monks (boys around 7 to 11 years old). Then I found the ‘Chiang Mai Historical Centre‘ which was much more official looking, with a leaflet and map not unlike the museums in England, but it was very small. There was a farmers market on today outside the museum, just a handful of stalls, I had a glance but there was no point me buying anything as I had nowhere to store it. I was just reading the history of Chiang Mai in the museum when the lady came over and asked if I had paid and where was my sticker (they always sticker you in Thailand). Oops, the architecture museum had been free so I had assumed. Anyway I went back out and paid my 90 baht entry fee (foreigner price lol, the sign is literally labeled price for Thai 20 baht and price for foreigner). I was given a sticker to wear and a paper ticket as well. The museum was air conditioned and very modern. I read quite a bit about Chiang Mai’s history but I have forgotten it all now…..
Down in the basement they have some (not greatly exciting) archeological remains of an old ‘Wat Phra Kaew’, from the Rattanakosin Era. I also found an interesting statue of ‘TheThree Kings’, the legendary founders of the City of Chiang Mai. The lovely seating area outside a temple, my fave buddha of the day, some religious hangings swaying in the breeze though the temple door, ‘The Three Kings’ statue, the legendary founders of the city. Got a Songtheaew back to my hotel as I had been walking in the heat all day. Tonight I met Daniel, Silja’s friend from Denmark, he hadn’t gone on the jungle trek with the others and was planning to spend a week in Chiang Mai and then we made a provisional plan to meet up after my week on the farm. He came and collected me from my hotel and we explored the two larger night markets and tried lots of different street food. As well as Thai street food there was a lot of world-food available. I also booked my bus to Pai from the hotel for tomorrow lunchtime. Next up: days forty-four and forty-five.